When we think of medieval knights, we all have the same mental image. We see noble, valiant men wearing shiny, protective armor. Perhaps they’re off to save a maiden in distress or defend their king’s honor. Whatever the case may be, one thing is for certain – medieval gauntlets are an indelible part of the image of the medieval knight. Despite the fact that most people know medieval gauntlets to see them, people generally don’t know the story behind these pieces of armor. Medieval gauntlets evolved quite a bit over the course of the entire medieval period. During the late 12th century, metal plate hand protectors were incorporated into armor. These early gauntlets protected hands, but they were a bit impractical because they were mitten-shaped and only the thumb was able to move. 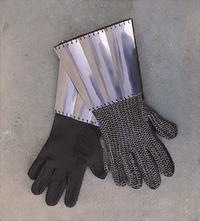 By the turn of the 14th century, chainmail gloves with separate fingers began to be used in medieval armor. These new gauntlet designs offered better protection and gave knights more dexterity. Individual plates were overlapped over the fingers, giving the whole hand equal protection from harm. These new changes to medieval gauntlets occurred because of advancements in blacksmithing. Blacksmiths developed technology that allowed them to craft metal with attention to detail and a higher level of artistry. The blacksmiths’ new techniques allowed knights to become more adept at protecting themselves and using fully articulating fingers and wrists for fighting purposes. The end of the medieval period, around the last half of the 15th century, is generally considered to be the golden age of medieval gauntlets. Blacksmiths not only perfected their craft, they also incorporated intricate designs and etchings into the gauntlets, giving them an elegant appearance. These medieval gauntlets featured sophisticated mechanics that allowed knights move their wrists and fingers with unprecedented ease. You’ve probably heard the phrase, “Throw down the gauntlet” before. It is derived from the act of a knight literally throwing his gauntlet to the ground as a symbol of challenging a foe. The significance of these indispensable pieces of armor was so great that this act was a declaration of a duel.